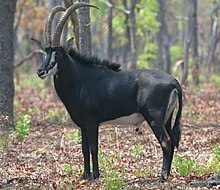 A bovid (faimily Bovidae) is ony o almaist 140 species o cloven-huifed, ruminant mammals wi characteristic unbranchin horns covered in a permanent sheath o keratin in at least the males. ↑ Grubb, P. (2005). "Family Bovidae". In Wilson, D. E.; Reeder, D. M. Mammal Species of the World (3rd ed.). Johns Hopkins University Press. pp. 637–722. ISBN 978-0-8018-8221-0. OCLC 62265494. This page wis last eeditit on 22 Juin 2014, at 19:01.